In the Golden Age of comics, Billy Batson first proved himself worthy of the powers of the Wizard Shazam. It wasn't long after that the Wizard began extending his powers to other people in Batson's life, making them superheroes as well. Among the first were Billy's sister, Mary Bromfield, who became Mary Marvel, and young Freddy Freeman, who became Captain Marvel Jr. They were eventually joined by the "Lieutenant Marvels"—three other boys also named Billy Batson who were nicknamed "Tall Billy," "Fat Billy" and "Hill Billy." These three could also access the powers of Shazam when they shouted the magic word in unison. The Marvel Family even had a non-super-powered member in an old man they nicknamed Uncle Dudley, who wore a homemade costume, and Mr. Tawky Tawny and Hoppy the Marvel Bunny, anthropomorphic animals who were considered honorary members. 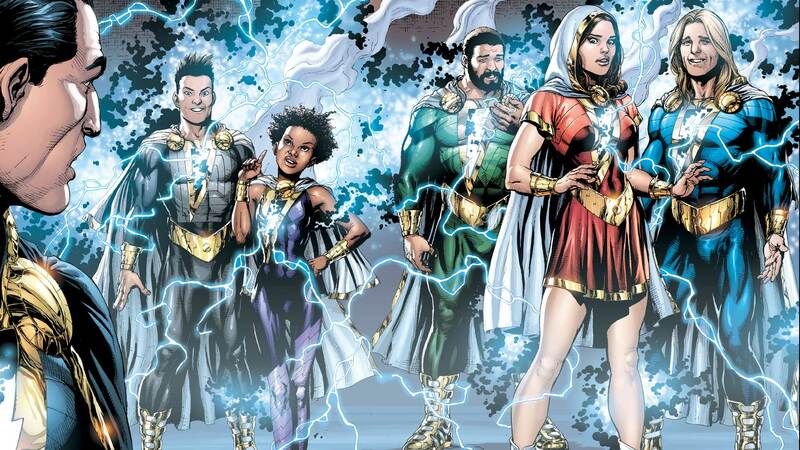 In the post-Flashpoint reality, the Marvel Family goes by the name "the Shazam Family" and are all the adopted siblings of Billy Batson, raised in foster care with him by Rosa and Victor Vasquez. Once Billy gained the powers of Shazam, he eventually discovered he could share those powers with members of his new family. Now, when his siblings Darla Dudley, Eugene Choi, Mary Bromfield, Pedro Peña, and Freddy Freeman say the magic word "Shazam," they too become adult superheroes. Each member of this version of the Shazam Family shares their power equally with the others, so if the six members are transformed at once, each of them gets only a fraction of the power level. For more on the Shazam Family's history, visit their page on DCUniverse.com.